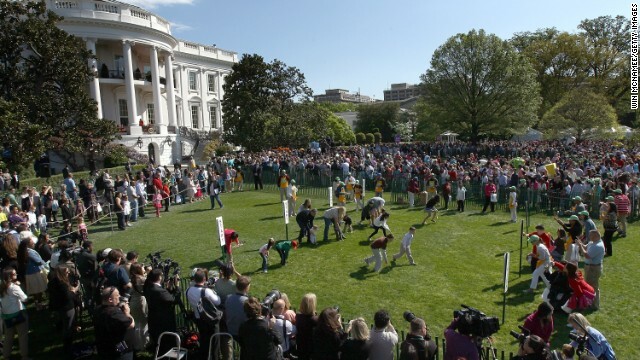 Washington (CNN) – Ticket holders for the upcoming White House Easter Egg Roll are being warned the annual event could be canceled if lawmakers can't agree on a measure funding the federal government. As for now, the event will go on as planned – though warnings have gone out to members of Congress and ticketholders that a partial government shutdown would cause the egg roll to be scrapped. In a memo to lawmakers, who receive tickets to the egg roll, the White House notes that "by using these tickets, guests are acknowledging that this event is subject to cancellation due to funding uncertainty surrounding the Executive Office of the President and other federal agencies." The memo adds that if the event is canceled, it would not be rescheduled. On Tuesday, White House Press Secretary Jay Carney said the egg roll was still on. "Because we distributed tickets to the Easter Egg Roll far in advance of the actual event, we alerted all ticketholders that this event is subject to cancellation due to funding uncertainty, including the possibility of a government shutdown," Carney said. "We have every expectation that the Easter Egg Roll will proceed as planned," he added later. A partial government shutdown would occur if Congress fails to extend funding authorization by the March 27 deadline, something leaders from both parties have said they'd like to avoid. A person familiar with the ticket confirmations said every attendee received the same cancellation warning on their ticket confirmation, including both members of Congress and those who won tickets through the lottery. The Easter Egg Roll – an annual event featuring games, music and the egg roll - is celebrating its 135th anniversary this year. It's slated to take place April 1. The White House announced earlier this month it was suspending public tours through September 30 as a consequence of the forced spending cuts-known as the "sequester." The move quickly sparked controversy, with some Republicans arguing the Obama administration was using the canceled tours as a political ploy to draw up negative reaction from the American public over the cuts. The U.S. Secret Service told CNN that the plan will help the agency save $74,000 per week – or $2 million over the next seven months, which is the scheduled length of the ongoing forced budget cuts. That total covers the cost of paying 37 uniformed officers $50 an hour for 40 hours a week to secure the tour's route through the East Wing. But that's just a fraction of the $84 million the Secret Service needs to cut from its $1.6 billion budget, according to the Office of Management and Budget. The officers normally assigned to the tours will be reassigned to other duties at the White House. Oh my! We are in Debt people! Gosh... can't we cancel an Easter Egg roll at the White House? I'm fine with it! Cut more please! There will be plenty of conservatives bad mouthing this, but cutting Easter Egg rolls and tours of the White House are better than cutting people from the payroll that will then end up on unemployment. Just more grandstanding with an opportunity to blame someone else. Here's hoping government-hater Rand Paul can come up with another one of those oversized checks for the Treasury. OK, this is getting silly. I know Obama is trying to get out the message that the sequester and other funding controversies are bad, but this is jumping the shark. He needs to make a big deal out of having his PAC or a wealthy donor pay for it. I'm sure congressmen are getting an earful from their constituents for the White House tours being cancelled. Just imagine if the Easter Egg Roll was cancelled. LOL and shaking my head. big deal it was for the families who work at the white house and congress and few token children from around d.c....who cares..another waste of money for the d c croward.. This, along with the Cancellation of The White House Tours, is an Outrage! Or political Blackmail? Both events have been a loved + longtime Tradition! Call it what you will. Conservatives complaining about spending cuts is bad for the image. Haven't you noticed that the leadership has shifted their talking points away from budgets and debts to improving their image? They know that complaining over cuts is loser for them. I suggest that you do the same. Congress decided where the cuts would be made, not the President, and the American people know it. Government is in debt, cut the frills. Easter Egg hunts are frills. How much will King O's trip this week to Israel cost taxpayers? This, along with the Cancellation of The White House Tours, is an Outrage! Or political Blackmail? Both events have been a loved + longtime Tradition! The cost of these events are a Pittance! To cancel them will not make the slighest Difference toward our Financial Woes! I am curious, how long the American People will put up with these Shenanigans? I am also wondering, what the First Family will go without this Holiday to save a few Nickels? – @Marita. Sorry, I was not finished with my comment the first time around! Thx! – @Marita. Why not just cancel Easter and be done with it?? These dolts can't see a solution that is right in front of them let alone act on it... This White House has the blame ganme down so well they actually stop progress.. They are the Seinfeld crew at the WH! "But that's just a fraction of the $84 million the Secret Service needs to cut from its $1.6 billion budget, according to the Office of Management and Budget. The officers normally assigned to the tours will be reassigned to other duties at the White House." It's the Cuts! Cuts! Cuts! you folks wanted, John Boehner. Cuts. Cuts. And more cuts. Could have told you it would also cut into your Jobs! Jobs! Jobs! mantra. Of course it also cuts into other peoples livelihoods as well. But, hey. Who really cares what happens to "hard working" Americans (yeah, I got the Luntz memo on the newest GOPer wording ready to roll out to the masses.) Guess we aren't to be called freeloaders living off of GOPer charity anymore. I find it ironic that the White House is canceling tour and Easter egg hunts. Really folks just how expensive are these things? T guess the public opinion tour continues. I am getting really tired of this. Make REAL cuts folks, not silly PR things. how ridiculious can obama get. I don't remember any president making a fool of himself like this one is. There is very little cost involve in this easter egg roll most of it is privately sponsored. Maybe obama need to stop wasting. After all this is our money going to waste maybe we can decide where it goes. Cut the golf, the parties, the vacations that we do not agree on and put that money on that easter egg roll if there is money missing there. Long story short – who cares? The smart conservatives have figured out that it makes them look like hypocrites to complain about what gets cut where. And tomorrow, as a result of the sequester, they're going to turn off the litttle red light at the top of the Washington Monument.